Enjoy free membership in our wine club and receive special wine selections 3 times a year plus wine club discounts all of the time. It’s a great way to be an ongoing part of Condor’s Hope. Learn more about wine club privileges and become a member. Our own wines are made from the fruit of the certified organic vines of our family’s 5-acre vineyard in the foothills of the Sierra Madre Mountains in the Cuyama Valley of northern Santa Barbara County. Our Mentor’s Old Vine Zin is from Benito Dusi’s 96 year-old vineyard in Paso Robles. These delicious, full-bodied wines are at their prime and come from grapes that are sustainably grown using traditional head-pruned and dry-farmed practices that are soil and water conserving. We recommend you let these wines ‘breathe’ for 20-30 minutes before enjoying. 2017 Shiraz: Possibly our best Shiraz yet. Full-bodied, aromatic, with a lingering smooth finish. 67 cases were produced using an initial whole berry fermentation. Enjoy this deep inky wine with a plum-vanilla essence. 2018 Rosé. We are very pleased to have our dry Rosé back this season. A blend of our organic vineyard’s Zinfandel, Mourvédre and Mission grapes, this dry, crisp wine captures the sage aromatics of the Cuyama Valley. 37 cases were produced. 2018 Pedro Ximénez. The 6 and 12-bottle selections also include the new vintage of our unique white wine. The dry minerality of wine made from this Andalusian grape, with citrus overtones, brings a smile to your lips and relaxation and joy to your mind. 43 cases were produced. In addition to the new releases, the 6 and 12 bottle selections will have the sumptuous 2016 Old Vine Zinfandel. This will be our final vintage of our Mentor’s Zin grapes and we are pleased to share this with you while it lasts. Enjoy this intense, full bodied wine with its chocolate finish. Added to the Condor Club 12-bottle Selection, from our private reserve, are two cellared varietals selected to complement your wine club offerings. We look forward to joining your holiday table with this Winter Wine Club selection, featuring our freshly harvested and milled 2018 olive oil and the new release of our 2016 Mentor’s Old Vine Zin. We are thrilled to share with you our certified organic, extra-virgin, dry-farmed olive oil. This year we only produced 8 gallons of oil, so this limited production will only be available to our Wine Club. There were low yields throughout California due to poor spring flowering conditions. Enjoy this ‘pure gold’, grassy, peppery, unfiltered oil directly on salads, topping for soups and veggies and, of course, with your favorite bread. The grapes for our 2016 Mentor’s Old Vine Zin come from Benito Dusi’s vineyard in Paso Robles and brings forth the complexity and full fruit forward with a peppery finish of a classic dry-farmed Zinfandel. Soar with the condors and compare Zins from 3rd, 4th and 5th years of our mentor’s 98-year-old vines with wine from the 5th year of drought from our 18-year-old vines in the Condor Clan and Condor Club Selections. We celebrate the season of harvesting with the new release of our 2016 Zinfandel. This was the 5th consecutive year of drought—and the plants struggled to develop fruit in our dry-farmed system. The fruit was small and concentrated and has developed into a beautiful wine with fruit aromas, and a flowery, vanilla elegance. Only 25 cases were produced—that’s just 1/10th of a good wet year production! This will be just for you, our wine club members to fully enjoy. We are complementing this Zinfandel with our 2017 Pedro Ximénez which is receiving wonderful accolades from the Condor’s Hope community. This unique white wine creates a moment of pause to savor the fullness and minerality that each sip refreshingly brings to your mouth. For the 6 and 12-bottle selections, we include our 2016 Shiraz. Enjoy this deep inky wine with a plum-vanilla fullness and an elegant finish. This is the last of this limited production (also only 23 cases). The Condor Club 12-bottle Selection includes two wines from our private reserve. You can interestingly compare how these aged in the bottle with the younger wines in this selection. The good rains of 2017 grew vigorous vines which are challenging to sculpt into the vines for the year ahead. With the Spring release, we are very excited to share our 2016 Shiraz with you. In 2015, the 4th year of drought, there was no Shiraz crop; so we’re pleased to have limited production in 2016, producing only 23 cases. Enjoy this deep inky wine with a plum-vanilla fullness after aerating for 20-30 minutes. Accompanying the Shiraz you’ll enjoy one of our favorites from 2014, the third year of drought: dry-farmed Zinfandel from Pat Wirz’ vineyard in Hollister, CA. The 6 and 12-bottle selections also include our 2014 Old Vine Zinfandel from our Mentor’s vineyard. Enjoy these intense, full bodied wines with their chocolate finish. Let them swirl in your mouth so you can fully appreciate the nuances. Added to the Condor Club 12-bottle Selection, from our private reserve, are three varietals: Shiraz, our vineyard’s Zinfandel and the Mentor’s Old Vine Zinfandel all from 2011, the last wet year before we entered 5 years of drought. You can compare how these aged in the bottle to the younger Shiraz and Zins. We look forward to joining you at your holiday table with our Winter Wine Club Selection, featuring our freshly harvested and milled 2017 olive oil and our 2013 Mentor’s Old Vine Zin which is in its prime. We are thrilled to share with you our certified organic, extra-virgin, dry-farmed olive oil. Use this grassy, peppery, unfiltered oil directly on salads, topping for soups and veggies and, of course, with your favorite bread.The grapes for our featured 2013 Mentor’s Old Vine Zin come from Benito Dusi’s vineyard in Paso Robles. This wine delights in its complexity and full fruit forward character and peppery finish of a classic dry-farmed Zinfandel. Soar with the condors, and order the full Condor Club case, and compare Zins from the 3rd and 4th years of drought from our 18 year-old vines, with a remarkable range of our mentor’s almost 100 year-old vines from our Cellar. Our own wines are made from the fruit of the vines of our family’s 5-acre vineyard in the foothills of the Sierra Madre Mountains in the Cuyama Valley of northern Santa Barbara County. The grapes in these wines are organically-grown using traditional head-pruned and dry-farmed practices that are soil and water conserving. Our carefully tended vines produce smaller grapes that develop the full cherry, raspberry, and blackberry fruit essence of dry-farmed Zinfandel. We celebrate the rain-fed 2017 harvest with the new release of two drought year wines that bring forward the intensity and low yields of the drought years. We especially look forward to sharing our 2015 Zinfandel with you, one of the best Zins we’ve ever produced. This is our first vintage from a fourth year of drought. Our yield was very low (only 44 cases) and the quality is extraordinary. The concentrated fruit is complex, yet very balanced. The richness of the chocolate-licorice finish lingers on your tongue. This young wine starts off beautifully and will age and develop over time. We are also releasing our Mentor’s 2014 Old Vine Zin. This intense-drought year wine concentrates flavors of raspberry and cherry with the classic Zin spice finish that only the wisdom of 100 year old vines can create. For the 6 and 12-bottle Selections, we include our 2011 Zinfandel for you to compare a wet year with the drought-year Zins as well as the 2016 Flamenco Blend, our delightfully crisp white wine that complements every meal. The Condor Club 12-bottle Selection includes two wines from our private reserve: our 2009 Zinfandel (also the 3rd year of drought) and our 2010 Shiraz (a wet year). You can compare how these aged in the bottle with the younger wines in this Selection. The Summer Wine Club Selection focuses on warm summer evenings and features the release of our 2016 white wine. With minimal production of our unique Pedro Ximénez grapes in 2016 due to drought, we blended them with some closely related dry-farmed Riesling from Wirz Vineyards. The name Flamenco Blend highlights the Spanish origins of the Pedro Ximénez grapes. This blend captures the full minerality and citrus overtones of our Pedro Ximénez. Enjoy this crisp, dry wine with cheeses, salads and fish. To further enhance the essence of summer we once again include our 2016 Rosé as a featured selection. This is being very well received for its refreshing taste and distinct strawberry fruit finish. In the 6-bottle option we’ve added both our 2013 Zinfandel and 2013 Old Vine Zin from our mentor’s vineyard in Paso Robles. 2013, the second year of drought produced a beautiful, concentrated full body wine. As a special treat, for the 12-bottle selection, we are including our Zinfandel and our Mentor’s Old Vine Zin from 2010. Enjoying comparing this wet year with the drought wines of 2013. Our 2017 Spring new releases will still be from the drought years and will bring forward the intensity and low yields the drought years typify. 2014, the third year of drought, is turning out to be an excellent quality wine year for us. Since our Zinfandel yield was so low (only 65 cases), we took the opportunity to get additional dry-farmed grapes from Pat Wirz in Hollister, CA. With this Spring Selection we release this intense, full bodied wine with a chocolate finish for your pleasure. Let it swirl in your mouth so you can fully appreciate the nuances. Along with the Wirz Vineyard Zin, we are releasing our 2016 Rosé blend, once again featuring our Zinfandel, Mourvedré, and Mission grapes in a light, dry strawberry essence perfect for the warm months ahead. For those with the 6 and 12-bottle selections, we include our 2014 Zinfandel for you to compare with the 2014 Wirz Zin and also the 2012 Mentor’s Old Vine Zin that has a delicate, bright flavor found in that first drought year. Added to the Condor Club 12-bottle Selection, from our private reserve, are the Mentor’s Old Vine 2009 Zinfandel (also a 3rd year of drought) and our 2005 Shiraz (a wet year). You can compare how these both aged in the bottle to the younger 2014 Shiraz and Zins. We look forward to joining you at your holiday table with this winter wine club selection, featuring the new release of our 2014 Zinfandel and our freshly harvested 2016 olive oil. The 2014 harvest, our third year of drought, produced only 51 cases of Zin. The smaller grapes, with a higher skin to juice ratio, show the promise of a very intense, full-bodied Zinfandel. As typical of our Zins, you can drink it now or lay it down for years to come. We are also thrilled to share with you our certified organic, extra-virgin, dry-farmed olive oil. Use this grassy, peppery, unfiltered oil directly on salads, topping for soups and veggies and, of course, with your favorite bread. Soar with the condors, and order the full Condor Club case, and compare three years of our Zin (one wet; two dry) and our 17-year-old vines with our mentor’s 96-year-old vines along with two wines from our Cellar. We celebrate this Fall harvest with the release of our 2014 Shiraz and a revisit to our 2011 Zinfandel. 2014, our third year of drought, produced very concentrated grapes and the Shiraz captures the essence of our vineyard with plum overtones and a smoky finish. As days grow shorter, enjoy the Shiraz with spicy meals, stews and lamb. It will also develop well in the bottle and lay down for years. Only 25 cases were produced. Along with the Shiraz, we feature our 2011 Zinfandel. This was a premium year for the vines and this Zin is aging beautifully in the bottle. The essence of raspberry lingers in your mouth as you taste the peppery finish. Be sure to aerate both wines so the full rich fruit forward and complex finish come through for your delight. In the Condor Clan 6 bottle selection, the two feature wines are complemented with the 2013 Old Vine Zinfandel from Benito Dusi’s Paso Robles vineyard. The Condor Club full case features three varietals from 2010, our last wet year in the vineyard! This wine club selection features the release of our 2015 Pedro Ximénez. We are proud to be the only California growers of this unique Andalusian white wine. Its full minerality and citrus overtones create a nice crispness with a completely dry finish. This vintage fills the mouth and tickles the tongue. Our 4th year of drought produced only 21 cases that are primarily set aside for wine club to enjoy. In the 6-bottle selection we’ve created a cornucopia of options to complement every type of meal. As a special treat, for the 12-bottle selection, we are adding two limited production Shiraz from our own cellar. 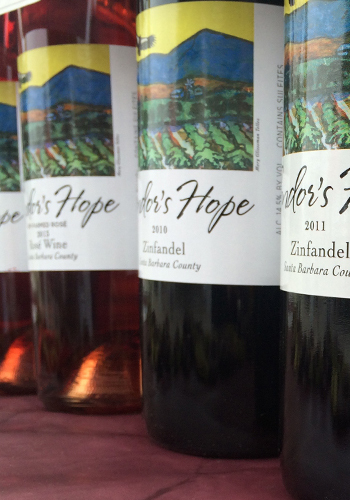 Let’s Zin our way into Spring with our Zinfandel Fest. A special treat for our wine club members, you’ll be able to compare the zinfandel from our 15+ year old vines with those of our Mentor’s 95+ year old zinfandel vines. In addition, for those with the 6 and 12-bottle selections, you’ll be able to compare wet (2011) and dry (2012, 2013) years from both of these traditional head-pruned, dry farmed vineyards. We celebrate the Fall harvest with the new release of our 2014 Rosé and a revisit to our 2011 Zinfandel. 2014 was our third year of drought. Grapes were very concentrated and our dry-style Rosé captures the essence of our vineyard with a crisp, refreshing strawberry-citrus finish. Enjoy the Rosé on these early autumn warm afternoons along with your favorite appetizers. Only 28 cases were produced. Along with the Rosé, we can’t help but feature our 2011 Zinfandel. This was a premium year for the vines and this Zin is aging beautifully in the bottle. Be sure to let it breathe before drinking so the full rich fruit forward and complex finish comes through for your delight. The essence of raspberry will linger in your mouth as you taste the nice peppery finish. In the Condor Clan 6 bottle selection, the two featured wines are complemented by the 2011 Old Vine Zinfandel from Benito Dusi’s Paso Robles vineyard. This wine club selection features two new releases: our 2013 Shiraz and our 2014 Pedro Ximénez (both drought years). The Shiraz is amazingly full-bodied, with blackberry nose and tastes of cacao nibs on the finish. There were only 11 cases produced! We are proud to be the only California growers of the unique Andalusian Pedro Ximénez. Its full minerality and citrus overtones create a nice crispness with a completely dry finish. In the 6-bottle option we add our 2010 Zinfandel which is drinking beautifully after 3 years in the bottle. As a special treat, the 12-bottle case has Old Vine Zin from our Mentor’s 2008 harvest, as well as two Zins and a Shiraz from our own cellar. This wine club selection features the new release of our 2012 Mentor’s Old Vine Zin. 2012 was the first year of drought and this old vine Zin brings the fruit of black cherries forward in this excellent full bodied, complex Zin. It will fill your mouth with fruit and spice, with a hint of chocolate on the finish. In addition we share with you our 2013 rosé. This blush blend brings forward the essence of strawberries and pomegranates, followed by a hint of spice on a smooth finish. In the 6-bottle option, we add our 2012 Shiraz, and the full case includes a six-year vertical selection of our Zinfandels, including 3 years from our cellar.